Need Help with Tree Removal, Lopping or Maintenance? 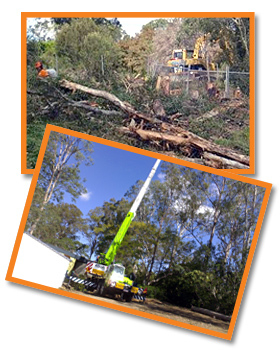 Tree & Stump Removal, Tree Maintenance Brisbane > What Can A Local Tree Service Offer? > Need Help with Tree Removal, Lopping or Maintenance? Correct pruning of trees is essential for their health, safety and longevity. We only prune to industry standards and will not engage in “tree lopping”. Our climbers do not use spikes on trees unless they are to be removed. Whether land clearing is being carried out for development purposes or simply in readiness for residential building, our 18” wood chippers provide a very fast and effective way of recycling the trees into mulch. Mulch can then be easily removed from site or left for future landscaping. On large development jobs, we usually work alongside an excavator and the tree stumps are left at 1.5m high for easy removal by the excavator. Even though A Local Tree Service does not promote cutting down trees, under some circumstances it becomes necessary to remove damaged or dying trees. Our expert arborists can analyse the condition of your trees to decide whether or not a tree should be removed. They possess the skills and use professional techniques to provide excellent services for all our clients. When a tree cannot be saved from a specific disease and it becomes inevitable that a tree will die, hire our services to remove it. Our arborists assess each tree service individually and focus on developing the best techniques for tree removal in Brisbane Northside. Whether you need a removal for a renovation project or need to make some space in your garden, we are the best tree removal company in Brisbane. We take trees down using professional techniques and tools and leave your premises clean and beautiful. We believe that trees are very important for our environment and also provide other benefits. However, when they start causing problems, they need to be removed. Our arborists are experienced to assist you with whatever tree services you require. How we remove the trees? When you hire us for our tree removal service, our arborists deal with all the issues associated with them. They can carefully dismantle trees to avoid any damage to the surroundings of your property. We are experts at what we do and have years of experience in this particularly specialised field. We understand that during tree removal, safety is paramount. Therefore, we use the latest tools and techniques to ensure that all our jobs are conducted safely, without damaging the surroundings. All our tree removals are undertaken according to government standards by fully trained professionals. Call us now at: 0403 599 881.